Liverpool Beatles Auction: Hung up on George? There were lots of odd items of Beatles merchandise in the 60s. 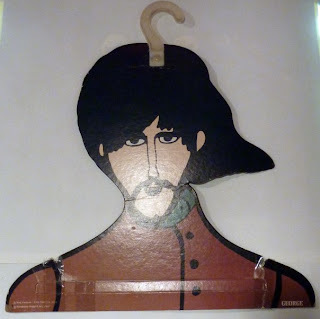 In 1968 there was a lot of items brought out to tie in with the Yellow Submarine film, including cardboard clothes hangers. Because they were made of cardboard they were often damaged. This George Harrison Yellow Submarine hanger has sustained a little damage around the shoulder areas as you can see. Still, if you are hung up on George you can bid on this item in our auction in August. It carries an estimate of £30-£40. Wigging out to the Beatles! Will Hottest Hits be a Hot Lot?